Home » Photo of the Day » WAIT! Is that Half Dome? WAIT! Is that Half Dome? This is an old story that I’m going to share again because some of you haven’t seen this or weren’t aware of this phenomenon. Let me just premise by saying there’s a lot of controversy and I even have photos I’ve taken myself. It seems crazy but in reality it’s just a weird happenstance of weather, physics and geography. Here’s Tony Immoos’ post regarding his photo. I took a quick look at www.yosemiteblog.com yesterday (19feb09), and noticed an interesting entry about the possibility of seeing Half Dome, in Yosemite NP, from Patterson, CA. 90 miles away. Always up for a challenge, I briefly played with Google Earth to see if maybe Half Dome could be seen from the San Joaquin Valley, I decided it could and was in the car and headed south from Sacramento soon after to attempt a few photographs. My destination would be Turlock, about 20 miles closer than Patterson as described at YB. The mountains surrounding Lake Tahoe quickly faded from view as I drove down Hwy 99 S, leaving very few high mountains visible. Looking at my map I saw that the freeway would do a left turn at Manteca and start getting closer to the High Sierra again. After leaving the Modesto Area, I could clearly see the snow capped High Sierra region in the Yosemite area. Approaching Turlock, Hwy 99 rises up at the Taylor Road interchange giving me an unobstructed view of the Sierras, taking a quick glance to my left, my eyes were instantly drawn to a familiar shape. There it was… Half Dome. 75 miles away, and it was very easily seen with the unaided eye. My next task was to find a suitable place where I could park and set up my tripod for the long lenses. I took a few images hand-held out the window of the car when I could and after a little while I found the perfect spot, Hall Road, .65 mile south of E. Keyes Rd. About 3.5 miles east of Denair, CA. and about 67.25 miles from Half Dome and in this image, shot at 400mm, the grain elevator is about 1.5 miles away. I took many other images with my Sigma 135-400mm and Tamron 500mm mirror lens. On an Olympus DSLR that equates to a 270-800mm and 1000mm field of view compared to a 35mm SLR. This was the one that had the best focus of all the ones I looked at. Other Yosemite landmarks in this view are, the upper portion of El Capitan, stretching from the grain elevator, right up to the face of Half Dome. Sentinel Dome is to the right of HD near the right edge and I believe that’s Clouds Rest above left of the grain elevator. I’m sure many other peaks can be identified but I not familiar with the YNP back country and I wasn’t able to ID any using GE. Also in view in the largest version is “The Diving Board”. From this Ansel Adams took the photograph, “Monolith: The Face of Half Dome”. It’s directly above the right arm of the telephone pole with the most stuff on it. I guess the next best thing would be to try and catch a Moon-rise above all of this. So Tony’s photo was taken on Hall Road east of Turlock, California in the Central Valley. The original image, which is now offline, was taken in Patterson, California, also in the Central Valley. Now, if you’re thinking, that can’t be real. Tony’s photo ignited a firestorm around the net. People couldn’t get over the idea that it was possible. But how? Half Dome isn’t even that big from the Gates of the Valley in Yosemite? So what causes this phenomena? Well, like I said it’s a perfect storm. Or actually, it’s after a perfect storm when the air is clearer and the barometric pressure is low but rising. Now I’m probably going to get this wrong but this is what most people believe is happening. After a storm the air is slightly heavier and thicker (barometric pressure). Well, it’s not really but bear with me. The way the hills are shaped and the curvature of the Earth coupled with the magnification properties of the air cause the mountains up the drainage to look bigger than they really are. It’s not JUST Half Dome. All the high country behind Half Dome looks bigger. So what do you think? There’s going to be thunderstorms this weekend which may present the perfect conditions if you want to check it out yourself. Late afternoon on Saturday or Sunday will be the best time to go when the afternoon sun is on Half Dome. I’ve personally witnessed this effect from Yosemite Blvd. in Modesto, Highway 99 in Modesto, Keyes, Turlock and Merced. I’ve been out to Hall Road looking for it and I’ve even tried to see it from Patterson, Gustine, and Newman. Give it a shot. Post your photos on Flickr, Instagram, Facebook or send me a link. I’d love to see them and share them. 22 commentsOn WAIT! Is that Half Dome? I think this is (at least in part) another manifestation of the “harvest moon on the horizon” effect. The moon in that position appears bigger than it really is, even with the naked eye. So to some degree it’s an illusion. But part of it is an optics effect, pertaining to lens magnification. Magnification does not result in an image identical to what you would see if you simply got closer to the objects you are seeing. A long lens magnifies DIAMETERS. In other words, everything looks x times WIDER than it really is. With no lens, you could walk closer to the grain elevator, and at some point it would look twice as wide, but at that spot Half Dome would look just the same. 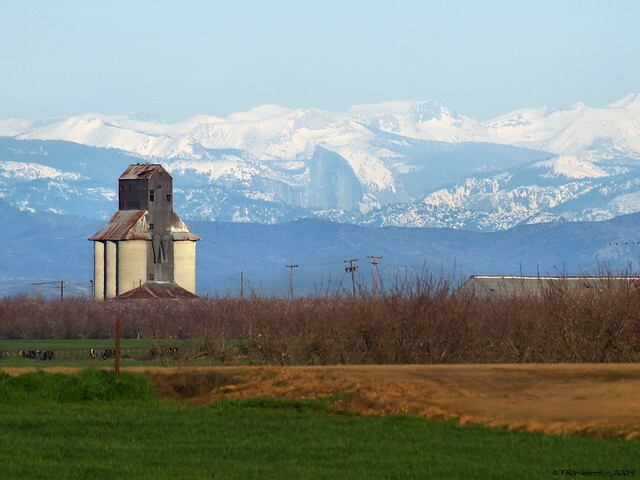 But with a long lens, making the grain elevator look twice as wide also makes Half Dome look twice as wide, and that’s an unreal effect. My gosh you must really be desperate… or crazy, to bring this one up again, lol. Photo is a fake. In the picture, you see the flat top of Half Dome. In order to see that, you would need to be higher in elevation than the top of Half Dome, which is 8842 in elevation. That elevation doesn’t exist in the Central Valley. Here you go. Taken a completely different day by me. The view angle from the camera position (175′) to the top of Half Dome (8842′) from a distance of 67.25 miles (355,080′) is only 1.4 degrees. Essentially it’s a horizontal view. This line of sight also passes directly over the viewpoint on Big Oak Flat Road in the park, 2566′ above it actually. I’ve seen it, taken pictures, panoramas, etc! It’s an amazing sight to see with the naked eye. In fact, I was driving thru Turlock a month ago on my way home from Sequoia and Kings and saw it from the freeway! A year ago I drove up to Mount Hamilton in the Bay Area and saw even more of it. Truley amazing. I just wish we had the same view the early settlers had without all the valley haze!